Window Tint Meter for Fixed & Roll Down Automobile Glass. 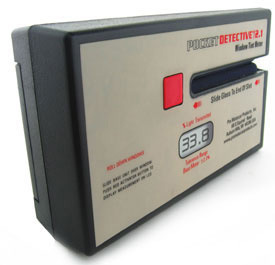 The Pocket Detective 2.1 Fixed and Roll Down Window Tint Meter offers unprecedented accuracy and reliability. This device offers solutions for both Visible Light Transmission (VLT) measurements along with Visible Light Reflectance (VLR) measurements. VLT is in reference to the percentage of light transmitted through glass and VLR is in reference to the amount of light reflected. The function of measuring reflectance is important for today's law enforcement and inspection facilities to insure proper visibility for the safety of the driver and public safety officials. Other Uses: The Pocket Detective can be used to measure optical properties of varying materials. 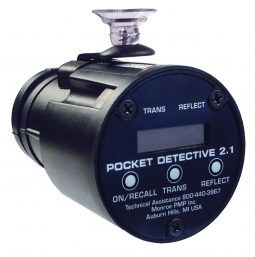 Additionally the Pocket Detective will measure reflective values on glass, plastic, including metalized or organic coatings. Shown with Transmission & Reflectance Magna Alignment Discs. Sample Thickness Range: .125" to .20"
The LM-9511 is calibrated to measure optical properties of auto glass in accordance to and in practice with test standards ANSI Z-26.1 and ISO 3538. 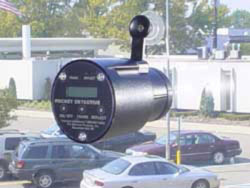 The Pocket Detective Window Tint Meter provides a compact, rugged and easy to use measurement system that measures light transmittance through automobile glass. 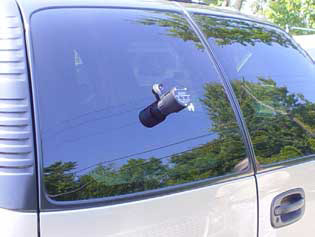 It is a slide-on unit for use on roll down windows. Used exclusively in states with largest inspection programs. Size: 5.635 x 3.25" x 1.428"